Twins who were born joined at the head have been successfully separated by a team of British doctors. Baby girls Rital and Ritag Gaboura, who are 11 months old, were separated on 15 August after four operations at Great Ormond Street Hospital for Children. They do not appear to have suffered neurological side effects. Only one in 10 million sufferers survive their rare condition. The Sudanese infants were flown to the UK by the charity Facing the World. 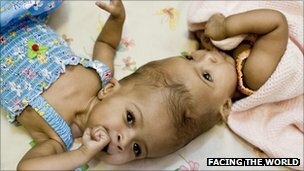 Conjoined twins are very rare and only 5% of conjoined twins are craniopagus, which means they are fused at the head. About 40% of twins fused at the head are stillborn or die during labour and a third die within 24 hours. The nature of the twins’ condition meant significant blood flowed between their brains. Ritag supplied half her sister’s brain with blood whilst draining most of it back to her heart. It was a life-threatening situation because significant drops in brain blood pressure would cause neurological damage. The children were born by Caesarean section in Khartoum, Sudan. The girls’ parents, who are both doctors, said: “We are very thankful to be able to look forward to going home with two separate, healthy girls. We are very grateful to all the doctors who volunteered their time and to Facing the World for organising all the logistics and for paying for the surgery. So far, the girls are reacting in the same ways to tests and stimuli as they did prior to surgery which suggests they have not suffered neurological side effects. However, their young age makes it difficult to determine whether this is definitely the case. David Dunaway, from the plastic surgery and craniofacial unit at Great Ormond Street, was the lead clinician and is also a trustee of Facing the World. 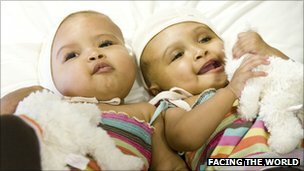 He said: “The incidences of surviving twins with this condition are extremely rare. The task presented innumerable challenges and we were all very aware of our responsibilities to the family and these two little girls. Facing the World is funded by donations from members of the public.